Often called the Gem of The Oregon Coast, Yachats is truly a gem of a village. 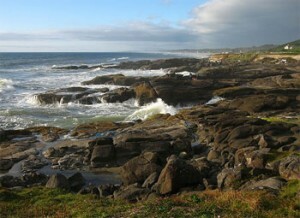 The name Yachats (YAH-hots) drives from a Chinook Indian word meaning dark waters at the foot of the mountain. The mountain referred to is Cape Perpetua, a basalt headland that towers over the coast just South of town. The area was first inhabited by tribes of native Americans who frequented the area in season to harvest abundant shell fish and net sea run smelt fish. There are several sites in an around Yachats where shell middens were created by the leftovers from shell fish harvesting and are easily visible but not to be disturbed. Yachats began it’s “official” development in the 1850’s as an Indian Agency site. Situated at the foot of Cape Perpetua, the area first gained national notice when the US Army established camps of soldiers to log the gigantic Sitka Spruce for use in making air frames for WW I airpcraft. The logs were transported by railroad to South Beach, just South of Newport, then by raft to Toledo on the Yaquina River where milling was done into finished lumber. Today, Yachats is a highly desirable destination for beach lovers, art enthusiasts, hikers, bird watchers and fisher people. Just South of town is the Siuslaw National Forest, Drift Creek Wilderness Area and Cummins Creek Wilderness Area. If your taste runs to great food, The Drift Creek Inn is a wonderful restaurant and pub. Another favorite is the Green Salmon Coffee and Tea House .